America is explicitly the subject of our most important photographers. Think of Walker Evans’ American Pictures, Robert Frank’s The Americans, Stephen Shore’s American Surfaces, Joel Sternfeld’s American Prospects, and Mitch Epstein’s American Power. Each of these artists set out to picture what is changing and unchanging in America. Some years ago Bruce Berman, the prominent motion picture executive who is Chairman and CEO of Village Roadshow Pictures, set out to assemble his image of America in a collection of works by these and other photographers. A selection of masterworks from the Berman collection is the subject of this exhibition, Everyday America. It features over one hundred photographs by thirty one outstanding photographers working from the 1930s through today. The photographers in this collection document, celebrate, and critique the everyday world in which we live. They introduce us to new ways of understanding America. These are not glossy images of powerful people. We are shown records of ordinary people, humble rooms, unimpressive buildings. We are shown the struggles of everyday people creating their own spaces in places where everything will collapse. What we are shown is specifically American; it could be nowhere else. 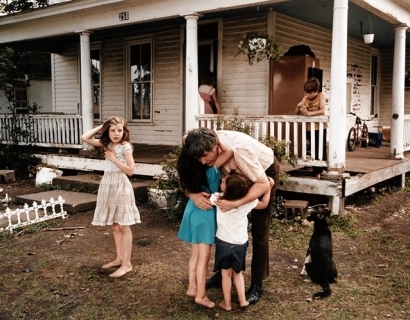 Everyday America: Photographs from the Berman Collection will be on view February 21st through March 23rd, 2013. Steven Kasher Gallery is located at 521 W. 23rd St., New York, NY 10011. Gallery hours are Tuesday through Saturday, 11 AM to 6 PM. For more information or press requests please contact Christiona Owen at 212 966 3978 or christiona@stevenkasher.com.